I am an 22 year old trying to compete in the hurdles, 100m, and long jump of the olympics. David = me + 10 years of age. you know, this is probably the weirdest post i've ever seen. to me, it's eerie and weird. the only thing making it less eerie are the troll face emoticons. sounds like david could use some upper body calisthenics .. other than that, david should make some progress. lol, cause I start so many threads, some of you guys thought I'm too annoying and "borderline spamming" so I thought if I'm going to make another post, I might as well try to be creative. anyway, interesting, calisthenics. I'm also curious as to why professional sprinters, those dedicated to being world champions, would even bother doing the following exercises: bench press, push press, etc. Sure push press involves entire body, but there are much better exercises if you're a pro sprinter. Sometimes the difference between a nobody and a world champion can come down to .005 seconds. That means the smallest edge matters. Maybe that .5 extra lb of upper body muscle hurt you by .005 sec. Why bother doing bench press, when you can just do arm swings or arm swings while bounding, which is much more specific to running. You get what I mean. If you want it that bad, to be the world champion sprinter, you're willing to make those sacrifices. I don't get why some of these sprinters get so top heavy. 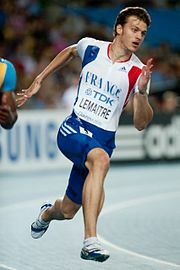 I think Christophe lemaitre is someone that has made the most out of what he has to work with. I believe he is training as optimal as possible compared to some of the other sprinters who have much better genetics than him. Sure this guy is an absolute beast in physique, but as a pro sprinter, why pack on so much upper body weight? Either he is not training optimal, or he doesn't want it bad enough to be the best possible sprinter he can possibly be, by sort of body building other areas non specific to sprinting. anyway, read the rest of my post. Tell me that is some interesting analysis. Well, in Harry Aikines-Aryeetey's case, the jacked af sprinter, I think he also profits off of that muscle. He's probably learned that by being so big, and so fast, that he can make alot of extra $$ without having to try and REALLY compete with the best in the world. He's insanely fast, but not elite fast. Would he be elite fast with less upper body mass? Maybe, maybe not.. Would he have a better chance at being elite fast with less upper body mass? IMHO, definitely. I remember way back he was still big, but not as massive as he is now. I imagine if we saw his sprint times, they'd have surely gone down as his weight went up. I agree that he's carrying too much upper body mass. If he's doing something specific to put on that mass, if I was coaching him, i'd stay STOP. I'd want him to atrophy alot of that mass back to a more normal range, while keeping as much as possible on his lower body. So i'd just swap out his upper body lifts that have hypertrophy time under tension, for dips/pullups and some maintenance level strength work using singles and such (80-90% 1RM). Bench can still be good for sprinters because, it can active and/or fatigue the nervous system. Getting the nervous system to "respond" the way you want, is important. So any heavy lift can be used as a tool to try and achieve some kind of effect, whether it's a delayed training effect, overall strength gain effect, immediate potentiation effect (heavy bench singles before some intense short sprints) etc. Some coaches use them for things like that.. I mean just think about it from the simplest sense, say you want to stimulate the nervous system considerably by moving a heavy load, but not tax the anti gravity muscles at all? What would you use? Bench sounds like a decent option.. So now you stimulated the CNS and can then use some of that stimulation in subsequent plyometrics, sprints, tempo, etc.. All kinds of weird techniques that can really work well with certain athletes.